Our In-company program is a perfect way to engage the Dutch design.thinking culture and take home practical and applicable experiences. We facilitate your talents to develop their entrepreneurial and innovational skills and mindset. The modern manager is an entrepreneur! Feeling your organization needs to keep up with new technologies. Feeling your organization needs new business models? Feeling your organization needs an authentic entrepreneurial culture? Our In-company programs empower your employees with practical in-depth knowledge in design thinking and finally unleash the entrepreneurial mindset of the participants. The ultimate program starts with a serious game, followed by the d.Learning fast track. During this course I learned more about personal leadership than in all my management development trainings over the last two years. During an innovation game participants get their first experiences with design thinking. The gamified program helps to accelerate learning and guarantees a sustainable skillset. At the end of the game participants get feedback on skills, mindset and behavior. This way they benefit at most, in order to practice those competences during an Innovation Expedition as the next step. 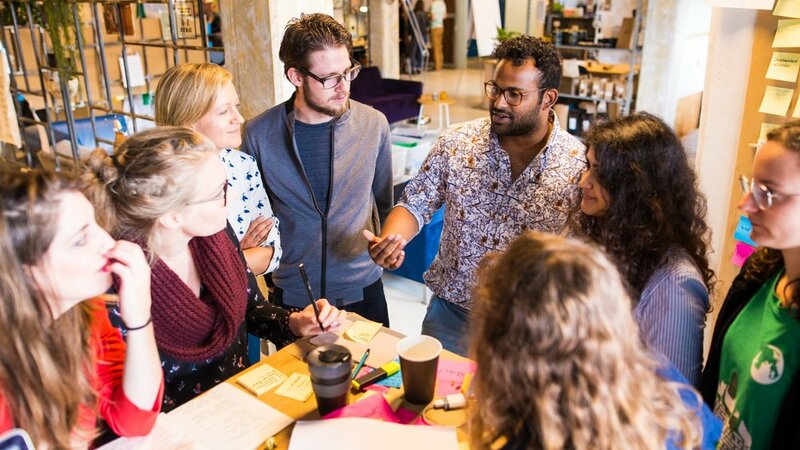 Our Innovation Expedition is designed to ignite management development teams with the Dutch desing.thinking mindset and skills, in order to transform the organization into an entrepreneurial, resilient, adaptive but most of all innovative organization. The Innovation Expedition is all about doing. During 20 weeks time an innovation team of 6 employees spend one day a week to practice their skills on a real-life challenge. Along the way, the team will get trained, coached and facilitated by experienced Dutch design.thinking trainers. Three-weekly there will be a meet and greet with our coaches in order to reflect on progress and struggles.